What spices come to mind when you think of the fall? I tend to think about cinnamon, ginger and cloves – things that you find in pumpkin pie – as well as apples, oranges and cranberries, even though those are fruits and not spices. 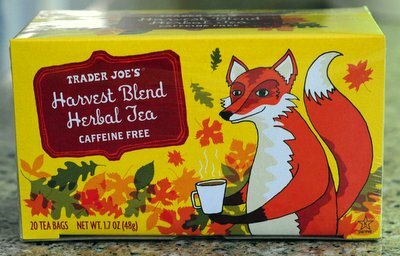 I love mixing and matching these flavors in my fall baking, and Trader Joe’s managed to put most of them together in their seasonal Harvest Blend Herbal Tea. The caffeine free tea really captures the spice and flavor of fall, which means it might very well be the perfect thing to warm up with on a fall night. I confess that I say that about a lot of seasonally spiced teas and coffees, but you can tell this one fits the season perfectly with just one whiff of a fresh cup. The base of this tea is chamomile, and it also has cinnamon, ginger, hibiscus, chicory, orange peel and apples in the mix. The cinnamon is probably the strongest flavor, but no one single element dominates the tea. They all blend together surprisingly well – and the combination is so addictive that you’ll find you’ve gone through a few cups without even knowing it. This tea is also a great base for spiced tea lattes, but if you are going to add milk, be sure to brew the tea at double or triple strength so it keeps its potency!